With the recent mega-success of Jurassic World and the reminder that people REALLY like monster movies, it seems all too convenient that one of the best monster movies of all time is celebrating its 40th anniversary this week. Still, one should take note of a simpler time, when the world could be terrified of a faulty mechanical hunk of plastic that nearly never made it to the big screen. But since people are remembering that giant monsters destroying things can make a fun movie, let’s talk about one of the classic summer movies with a big monster. Jaws was based on Peter Benchley’s 1974 novel of the same name and was just barely released on June 20, 1975. I say just barely because this was a famously troubled production. Mostly shot on location on Martha’s Vineyard in Massachusetts, 26-year-old director Steven Spielberg brought the movie from a budget of $4 million to $9 million and took 159 days to shoot. Spielberg had to deal with three large mechanical sharks (all named “Bruce” after Steven Spielberg’s lawyer, Bruce Ramer): a “sea-sled” shark that was towed by its belly and two “platform sharks” that were used to shoot from a left-to-right camera. The sharks would malfunction frequently, the script was rewritten many times while in production, actors and crewmembers became disgruntled while shooting at sea, and Spielberg admitted that his perfectionism and inexperience added to the trouble. But in the long run, Spielberg had his heart in the right place. He insisted on shooting at sea to make the movie appear as realistic as possible. 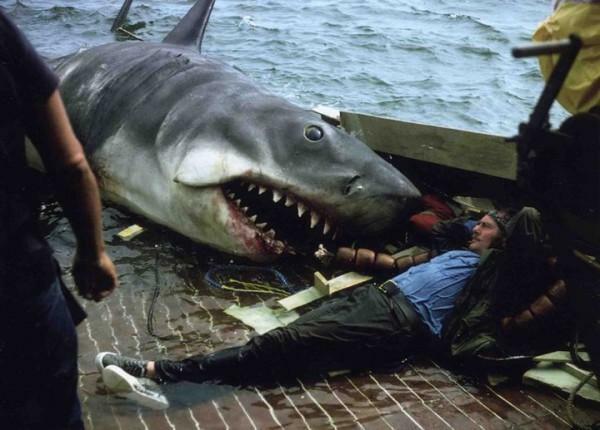 In fact, the constant malfunction of the sharks helped the movie, as Spielberg was forced to shoot scenes without showing the shark in the first half of the movie. The point-of-view shots from the (invisible) shark allowed more suspense to build, along with John Williams iconic score. Be honest, how many times were you scared by friends when they’d start humming that signature score behind you in the water? So what about the end product? Does Jaws still hold up 40 years later? Most definitely, yes. Spielberg has always been a master of pacing (see Jurassic Park), and Jaws is no exception. Spielberg did a great job of spacing out scenes between the character development and the shark scenes. He uses the secrecy of not showing the monster to keep the audience guessing, waiting to see if the beachgoers are being eaten by a monster, an alien, or just a giant shark on its cheat day. He also knows how to direct the banter between Martin Brody (Roy Scheider), Matt Hooper (Richard Dreyfuss) and scurvy-sounding Quint (Robert Shaw). 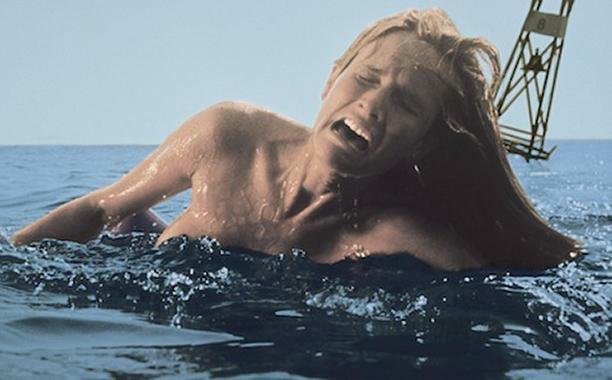 Jaws wasn’t looking to razzle and dazzle audiences, it wanted to legitimately terrify people. Jaws is still a presence greatly felt in other summer blockbusters today. The best example that comes to mind is last year’s Godzilla reboot, which took its time bringing the King of Monsters to the front of the camera. Piece-by-piece, the audience started to put together just how massive and dangerous the monster was, just like in Jaws. Whereas most summer blockbusters go full-throttle with the action and leave audiences with motion sickness, Jaws knew how to keep audiences invested. While getting to know the human characters and seeing what makes them relatable, the audience salivates for another monster scene. That’s balancing what makes a great movie and what makes a great crowd-pleaser, something summer movies so rarely do nowadays. Next ArticleTV Review: Orange Is the New Black (3x05) "Fake It Till You Make It Some More"